Most newsletters focus on accumulating the wealth necessary to enjoy a comfortable retirement. Most newsletters target the 35-55 crowd, which are the people who are actively saving towards their retirements, but are still a decade (or three) away from actually retiring. 1. People who are within 5-10 years of retirement. 2. People who are already retired. This newsletter won't tell you which growth stocks to buy for your portfolio. Instead, it focuses on issues such as estate planning, taxes, insurance and health care. Sure, there are certainly portions of the weekly newsletter that will cover investment strategies, however these strategies are more focused on enabling you to successfully nurture and cultivate your nest egg. When it comes to investment strategies that this newsletter espouses, "long-term income" is the mantra, rather than "high-risk growth". The newsletter will give you helpful strategies that will seek to transform your nest egg into an income-producing workhorse, without taking any unnecessary risks. The author of the newsletter, Robert Powell III, realizes that most retired or soon-to-be retired people are risk-adverse, and this shines through in the newsletter. The newsletter also focuses on recent law and rule changes that could affect your retirement, and how to best cope with (or benefit from) the changes. In addition, you will also find helpful articles that cover such topics as effectively managing pension and IRA distributions. Robert Powell III is a noted personal finance journalist who has been featured in such publications as the Wall Street Journal and the Financial Times. Powell is also the executive producer of the "More than Money" series on PBS. If you are worried about the content of the newsletter, don't be. 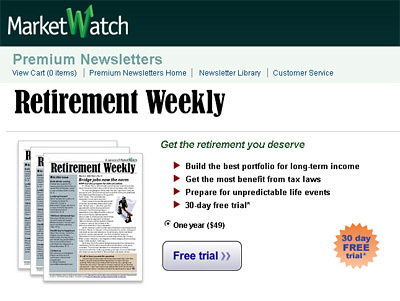 Marketwatch (which is the parent company that distributes the Retirement Weekly newsletter) offers a FREE 30 day trial of the newsletter. 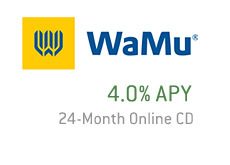 Simply sign up for the newsletter and Marketwatch won't bill you for 30 days. If you decide to cancel before the 30 day trial period is up, then you won't be billed a penny. 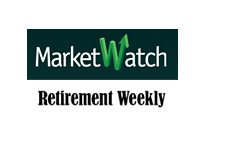 Marketwatch.com is a reputable company that is a wholly owned subsidiary of Dow Jones. Other properties in this group include WSJ.com and Barron's. Why do I mention this? 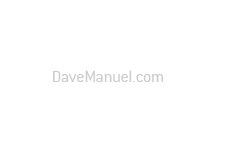 Just so you know that this company is a reputable one, and so that you aren't worried about getting ripped off.